A visit to the Kinta valley would not be complete without a trip to Taiping’s night safari. Far from its image as a retirement town and a sleepy hollow, Taiping and its environs, seem to be packed with activities for every age-group, from jungle trekking to coastal fishing. 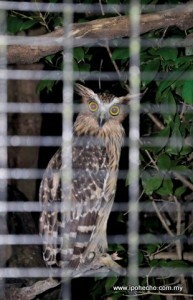 On the Taiping night safari, children will be delighted that they can watch nocturnal animals under the soft moonlight. The Taiping zoo houses 180 species of animals in a beautiful natural setting of lakes and lush vegetation. 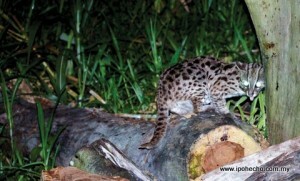 It is spread over 34 acres and is one of a handful in the world offering a night safari. The others are Singapore, Chiang Mai (Thailand), and Guangzhou (China). On the day we visited the zoo, the weather was uppermost in our minds. Taiping is known to be one of the wettest places in West Malaysia. If it rained when we got there, it would have been a wasted trip and a disappointing drive back to Ipoh. Going to the Taiping night safari by public-transport is impossible. Perhaps, those in charge of VPY 2012 could bear this in mind. Not everyone has their own transport and Perakians have yet to benefit from a reliable, cheap and efficient public-transport network. As we drove to Taiping, the darkness of the highway gave way to the lights of the exit at the Kamunting Toll Plaza. One could feel the excitement building up but our spirits were dampened when the signs petered out on the way to the Zoo. At night, the signs to the Zoo were difficult to find. The roads were poorly lit and many signs were obscured by trees and billboards. We had no problems parking at the Zoo and as we went mid-week, during the term-time and did not find the place crowded; however, the queues can be lengthy during the school holidays. There was a student discount for those with an International Student Card. When our mini-train arrived, we set off on a guided tour of the Zoo. The train driver gave us a commentary of the animals as we passed their enclosures. It would have been nice if he had explained a little more about the habitat of the animals and any other interesting information which would have enthralled visitors to the Zoo. We were grateful that he drove slowly so that we could appreciate the animals, read the information tablets outside the cages and try and locate the animals. The open concept of the Zoo ensures visitors are given a good view of the animals from a relatively close range. The large animals like elephants, tigers, lions and bears, were separated from us by moats. The smaller animals with glass barriers or wire fences. It was thrilling to observe the animals in a good approximation of their natural habitats, seeing them forage for food, mate and sleep. The best bit of the evening came after the 25-minute mini-train ride, when we were able to explore the Zoo on foot along good paths, which were well sign-posted, and return to the animals which had interested us most. We went back to see the crocodiles which were only a few feet behind a wire fence, and if we wanted to, could reach out to the hippopotamus which was staring at us. A few giant fish, measuring around five feet in length living in the brackish water were fascinating but the tigers were disappointing as they seemed lethargic. The lions were a joy to watch for they were chasing each other. They gave us a nasty fright when they roared loudly and ran towards us. We wondered if the primates were fast asleep, and were saddened that the snakes section was closed. It all ended too soon, and we thought it was a trip that was well worth the journey from Ipoh. The night safari is not without faults. The lights outside the animal enclosures faced us and blinded us so that we were unable to view the animals properly. The engine of the mini-train was noisy and belched smoke which spoiled our enjoyment. We did not have the same experience in Singapore which used quiet, clean engines and animals like the Malayan Tapir, would occasionally wander across our path. Some of the information plaques outside the animal enclosures were missing or incomplete and we wondered if some of the unmarked cages were empty, or the animals were hiding. We also saw that many pieces of broken equipment had been dumped beside the paths. We laughed when we overheard a woman tell her friend that she was not returning because “the place smells of animals” and she could not see anything. But the joke was on us when we took another hour trying to find the signs to get us back onto the highway to head back to Ipoh. We kept ending up at the main entrance to the Kamunting Hilton. Despite some shortcomings, the Taiping Zoo night safari is well worth a visit. Join us as we explore Gua Tempurung in the next instalment of the Ipoh Echo. I agree with Anthony Ng-our trip to the Safari was similarly disappointing. We had to park on the road for lack of parking in the car park. In the zoo itself many of the enclosures were empty, many lacked signs, and there was a lack of information about the animals. It seems the zoo was in a process of gradual renovation: some enclosures were far better and had more modern signs. Others were very behind the times. We avoided the trains in favour of walking at our leisure (which I think was a better option). Overall, I would say that the fairly low entry fee makes the zoo worth a visit if passing, just don’t make the zoo the focus of your day out. My family & I visited the place a few months back but the experience was nowhere as ‘worth a visit’ as MM wrote. The mini-train we were on, in addition to being noisy & smoke-belching, had such a poor speaker system, we could hardly hear the ramblings of the driver/guide. The mini-train only stopped once (at the elephant enclosure) and we did not have the opportunity to ‘explore the Zoo on foot’ as MM did as the driver/guide next dropped us right at the exit! Add poor lighting, broken directional signs and missing/unreadable plaques… none of us will ever want to return to the Night Safari again!